Eden Hazard is adamant that he is not thinking about his future beyond this season because he is targeting Europa League success with Chelsea. The 28-year-old Belgium international playmaker has been linked with a possible summer switch to Real Madrid on the back of coach Zinedine Zidane's recent return to the Santiago Bernabeu. Hazard will enter the final year of his contract at Stamford Bridge at the end of the season and Chelsea have already rebuffed one bid from Real Madrid for his signature. We can win the Europa League - we must win the Europa League, or finish in the top four to play in the Champions League next year. 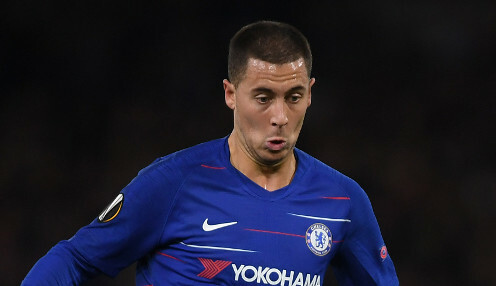 If he fails to pen an extension between now and the summer it is likely that the Londoners would cash-in, but Hazard is refusing to contemplate his long-term future as the side battle to qualify for Champions League football via the Europa League and a top-four Premier League finish. When asked about Real Madrid, Hazard told VTM News: "I'm not working on that right now. He added: "We can win the Europa League - we must win the Europa League, or finish in the top four to play in the Champions League next year. Chelsea are 6/4 to win the Europa League and are priced at 10/11 for a Premier League top-four finish.